To learn more about our recycling programs, please click here. Customers are not entitled to tax deductions or rebates for returned supplies. This program may be modified or discontinued without notice. 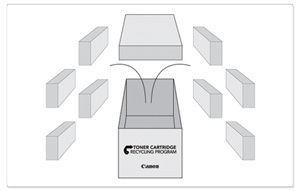 Canon only authorizes the use of this site to print labels to return Canon Brand cartridges/bottles and waste toner containers. Any unauthorized use may result in the return to sender at sender's expense. For customers in the United States (48 contiguous states): Please click here to obtain your Canon Return ARS Label. Please be sure to view the Packaging and Shipping Instructions tab. 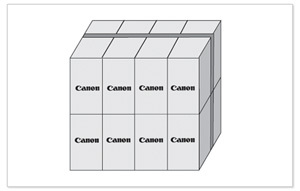 For customers in Hawaii, Alaska or a United States Territory, please contact 1-800-OK-CANON. For customers outside the United States, please go to www.canon.com/recycle/. If possible, please return more than one acceptable Canon Brand item per shipping label to help conserve resources, reduce energy use and shipping costs. Repackage the empty acceptable Canon Brand item utilizing the wrapper and pulp mould end-blocks from the new item’s box. Print the Canon Return ARS Label. Secure the label on the box. Give the package to your UPS driver or drop off at the nearest authorized UPS Store/Customer Center or UPS Authorized Shipping Location. Complete steps 1-3 from single item return. Bundle multiple boxes together securely with tape. Complete steps 4-5 from single item return. Place as many acceptable Canon Brand items that will safely fit into a sturdy shipping box. Complete steps 2-5 from single item return. For customers wishing to make a return from Hawaii, Alaska or a United States Territory, please contact 1-800-OK-CANON. Do not send defective cartridges for replacement. Defective cartridges under warranty should be exchanged by an authorized dealer or service facility as provided in the warranty. Canon only authorizes the use of this site to print labels to return acceptable Canon Brand items. Any unauthorized use may result in the return to sender at sender's expense.